Sure, Frogga. The reason you have nothing to do with women has nothing to do with your poor grammar or bizarre appearance. It’s because you don’t want to bother with them. 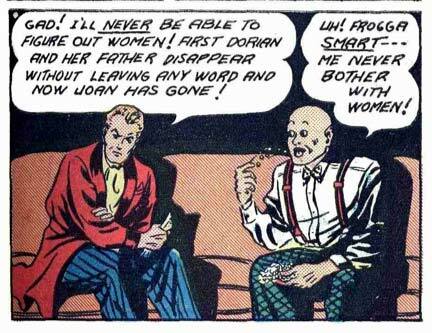 Why do all foreigners in the old comics sound more mentally deficient than of foreign? @X-stacy: I think you might be onto something. Given Myro’s insightful analysis of the situation, perhaps he does have more to do with it than he lets on. Maybe Frogga hooked up with the other guy to use him as bait and only pretends to be mentally challenged. Like I said before, Frogga doesn’t bother with Women!